If exit polls by India’s media outlets are to be believed, Uttar Pradesh (UP), India’s most populous state and the one where I live, will soon have a new political leader. Over the past few weeks, UP, along with states like Punjab, Goa, and Uttarakhand, has been in the midst of election fever as it puts together a new legislative assembly. As usual, elections in UP have been closely watched across the nation. UP has always been a politically fascinating state, and there some very interesting clashes of personality among its politicians. The 2012 election, for example, has been a high-wattage, four-way struggle between the incumbent Chief Minister Mayawati’s BSP, the Congress Party (with a campaign headed by Rahul Gandhi), the Samajwadi Party (which has a young dynast in Akhilesh Yadav), and, of course, the Bharatiya Janata Party. Pollsters over the weekend forecast a big win for the Samajwadi Party, thanks to the political pragmatism of Akhilesh Yadav. But the UP verdict was supposed to seal Rahul Gandhi’s reputation as a political heavyweight. Surprisingly, this change in power is leaving many of us in Noida unfazed and uninterested, mostly because although we had a choice of four different parties, we know that things are unlikely to change much whoever wins. There isn’t much difference between the parties – if one promises infrastructure expansion, the pledge will only be realized with much corruption. And the candidates in the parties don’t look that different from one another either. Interestingly, when Noida, the constituency that I belong to, went to vote last week, it was heartening to see many of my urban neighbors, who have been much maligned for their upper middle class apathy, going to vote. 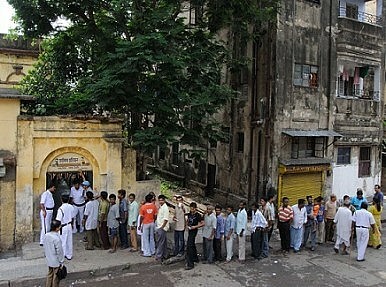 Several private employers in the city had given their employees the entire day off to encourage them to exercise their franchise. Unfortunately, I hadn’t yet received my “voter ID card,” which is necessary to cast your ballot. But sitting at home and not making an effort to vote wasn’t something I felt comfortable doing. So, armed with a collection of identification documents – passport, driver’s license, home lease papers – that showed I indeed had a Noida address, I went to vote. Alas, my name somehow hadn’t made it onto the voting list, and I wasn’t allowed to cast my ballot. I doubt that even five years ago I would have felt this guilty about being unable to vote. But thanks to a more vigilant media, over the past few years pockets of the urban middle class have slowly been re-engaging in the political process. Now it seems it’s the pinnacle of citizen duty to vote. Yet do I really feel that my vote was going to make a difference? Watching the exit poll forecasts on TV last weekend, I felt that whichever party won, things were unlikely to change. Yes, you can vote. But is the choice we are given really any choice at all. India’s ruling Congress party has suffered a major setback in key assembly elections. Does the rise of regional powers spell the end of a Congress-led government?